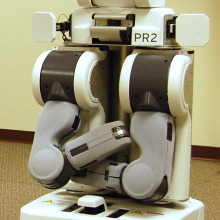 Mobile robots could be much more useful in homes, if they could locate people, places and objects. Today’s robots usually see the world with cameras and lasers, which have difficulty reliably recognizing things and can miss objects that are hidden in clutter. A complementary way robots can “sense” what is around them is through the use of small ultra-high frequency radio-frequency identification (UHF RFID) tags.